Please note: for your application to be considered you must provide the following documents: (1) current resume; (2) cover letter; and (3) a written personal reference. Your reference letter can be from a teacher, counselor, coach or supervisor. Intern will assist the Volunteer Department with administrative support and be involved in the Volunteer onboarding processes, including intake, training, and placement as an official Central Park Volunteer. The Intern will learn about the many volunteer opportunities offered by Central Park Conservancy and how we recruit, train, and manage our volunteers. Helping to collect materials and prepare folders for Volunteer Open House orientations and training sessions. The internship experience will provide an in-depth introduction to various aspects of horticultural focused volunteer work in a public space. 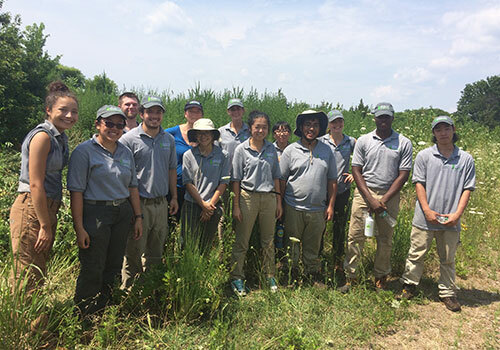 Interns will work directly with members of the operations team performing general park maintenance and horticulture projects with groups and individual Central Park volunteers. Documenting volunteer hours for Volunteer Dept. Working with oil-based paint in addition to horticulture-based work. We are looking for an HR intern to perform various administrative tasks and support our HR department’s daily activities. This internship is designed to be both educational and practical. In this position, the intern will learn how to take skills she or he may have acquired in school related to his or her particular areas of interest, and apply them in a professional setting. He or she will gain a better understanding of the role that Human Resources can play in a non-profit setting, and be better prepared to work in the arena of human resources and the nonprofit sector. If you are interested in kick-starting your career in HR and getting a closer look of how the backend of our organization works, then this is the job for you. Interns will assist Natural Areas Technicians in general park maintenance and horticulture duties in our four designated Natural Areas - North Woods, Ramble, Hallett Nature Sanctuary and Dene Meadow. Focusing on native plants and ecology, interns will work on landscape and habitat restoration in woodland, aquatic and meadow environments. Intern will assist garden staff and volunteers with the horticultural and landscape maintenance of Central Park's gardens, featuring hundreds of plant species. The internship experience will provide an in-depth introduction to various aspects of landscape management in a public space. Interns will work directly with members of the Landscape Management team performing general park maintenance and horticulture projects. The internship experience will provide daily hands-on learning and training of Ballfield maintenance work on Central Park’s softball and baseball fields or lawn bowling greens. Background or course work in horticulture, sports field maintenance, or turf care. 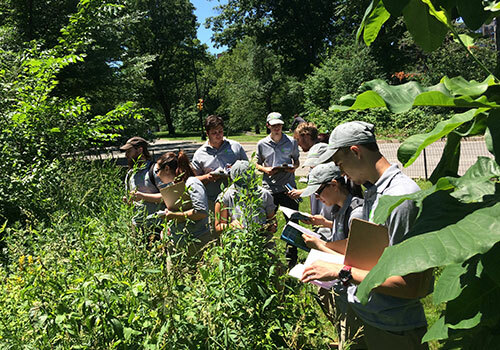 The intern will learn about the Tree Care operations of the Central Park Conservancy – including tree pruning, planting, removal; and learn to identify tree species, hazards, disease, and insects. Intern will perform all the duties of the Tree Care Intern, however, with documentation of up-to-date certification in all the following, the intern will be able to perform additional duties as noted below. The Central Park Conservancy uses Geographic Information Systems (GIS) to help manage park features and work records in its stewardship of Central Park. The Conservancy’s Data Staff support care and oversight of Central Park’s 20,000 trees, 9,000 benches, 2,500 light poles and 843 acres. The Operations Data & Asset Management intern works with the GIS Project Manager and Operations Data Coordinator to assist with park-wide GIS projects. These projects often include working with Central Park Conservancy’s Tree Care crew, Bench crew, Infrastructure crew or Women’s Committee. The intern will learn how data management can inform and support operational functions of an urban park. Intern will assist the Public Programs department in executing, facilitating, and evaluating various programs. The intern in the Visitor Experience Department of the Central Park Conservancy primarily supports day-to-day operations of visitor centers and kiosks by providing visitors with general information, directions, history and public programming that seek to enhance each person's experience in the Park. Perform general administrative duties as needed such as answering phones and email, filing, scanning, statistics tracking, etc. This position occasionally requires lifting of moderately heavy items (up to 30 pounds) and long periods of standing as well as walking to various locations throughout the Park as needed. Schedule: Schedules are determined based on facility/programming needs and may change. Regular weekend work and some holiday work is required. Content Interns will assist the Communications and External Affairs department. This position will support teams in various areas of the department, including press, internal communications, social media, graphics, and the website. Responsibilities include researching and writing content for internal and external audiences, assisting with press and social media monitoring, and helping to manage the Conservancy’s website and internal databases. Researching and writing copy about Central Park and the Conservancy for publication on the website, internal information library, and other platforms. The Central Park Conservancy has a 9-person Information Technology team that support all 350 staff members across the park and its 13 offices. The Information Technology Intern will have general computer and networking skills and be interested in working in a technology department assisting support and network staff with projects. The candidate with get exposure to all aspects of a technology department and how it supports an organization with a variety of technology needs and equipment. Projects will be determined based on skill set. Knowledge of Salesforce, Smartsheets, Adobe CS, Wireless Access Points, firewall and VPN configurations, and cloud-based services. The Central Park Conservancy raises 75% of Central Park’s nearly $80 million annual operating budget. The Development Intern works with the Director of Individual Giving, Director of Corporate Development, Director of Membership, and Director of Institutional and Planned Giving to assist with various fundraising projects (both unrestricted and capital). These projects often include researching and cultivating supporters, learning to use and manage the organization’s donor database, tracking and evaluating fundraising efforts, and assisting to organize and help at stewardship events. Entering major giving proposals in Raiser’s Edge for fall solicitations. Assisting with planning and follow up for major donor and perimeter stewardship events. Assisting with gift pyramids (researching, data entry) for various capital campaign projects. Working with Graphics department to work on fall issue of the Vine, the Conservancy’s major donor newsletter, as well as updating the major giving membership brochures. Assisting with assembling premium/gift packages for new members. Collecting demographic information on current donors. Conducting donor/prospect research using LexisNexis, Relationship Science, Research Point, and other resources. Assisting in updating Raiser’s Edge records to reflect most up to date corporate information including HQ addresses and more - Provide onsite Day in the Dirt support assisting in greeting, project support and any corporate special requests. Helping to identify relevant corporate grants and begin drafts of the applications. Assisting in the creation of a Gilder Run Paving Stone map. Other development related tasks as needed. Desire to pursue a career in philanthropy, non-profits, or cultural management, with an interest in learning how to become an impactful development professional. Excellent organizational skills, attention to detail, time management skills and the ability to prioritize. Interns working within the Planning, Design, and Construction (PDC) department will assist studio landscape architects in either or both the design and construction phases of current projects. Candidate roles will be established at the time of selection depending on current workloads. Design related work will include opportunities for involvement with both field and office tasks necessary to support current projects in design. Construction related work will primarily be focused on field work throughout the Park to support projects currently in construction. Site reconnaissance, inventory and analyses. Preparation and development of schematic designs. Preparation of illustrative presentation graphics or documents. Conducting materials research and coordinating material procurement. Inspecting material deliveries and completed work for compliance with contract documents. The Community Relations and Special Events Intern supports the work of the Conservancy’s Film & Special Events and Community Relations departments. Assist with calendar updates and scheduling of events, film and photo shoots, etc. The Office of the President intern will work alongside the President and CEO and her team while learning the process of developing and propelling President’s Office initiatives. This entrepreneurial internship will include opportunities to work on strategy, business development, fundraising, marketing and communications, urban park management and operations, governance, and high-level administrative coordination. Intern will be given the opportunity to join team meetings when available. They will learn the process of providing analysis and recommendations to the team and participate in problem solving and project implementation. Board Prospect Research: Expand upon the Conservancy’s current list of prospective board members by conducting research in target industries and building a case for prioritization and outreach. 40th Anniversary: Assist with the planning and coordination of the Conservancy’s 40th Anniversary (scheduled to kick-off in spring 2020), including preparation and research for internal meetings, assistance in maintaining the overall project budget, research and coordination of aligned public programming and exhibitions, assisting with coordination of donor events, and supporting the management of key external partnerships. The Institute for Urban Parks Intern will work alongside the Manager for Continuing Education and Evaluation to develop essential skills in workplace research, writing, and educational content production. This entrepreneurial internship will include opportunities to work on primary and secondary research projects focused on themes of volunteer management and public-private partnerships in urban parks, with coaching from Institute staff on research, writing, and content development. The intern will learn to develop scholarly literature reviews with an emphasis on citation management and identifying gaps in existing research on selected topics. Developing a synthesis literature review of findings from primary research, identifying broad themes in existing research and gaps/deficiencies that call for new modes of primary research. Developing exploratory primary research into themes of urban park management with an emphasis on developing and testing open-ended interview protocols. Writing clear and accessible blog posts, tip-sheets, and other public-facing content that summarizes research findings for urban park practitioners. Clear verbal and written communication skills, with an ability to present information and data in a concise manner. Basic understanding of scholarly reference/citation practices. Demonstrated interest in and/or understanding of non-profit organizations, public park management, and/or urban planning. Interning with the Central Park Conservancy these last two months has been one of the best experiences of my life. After attending the University of Georgia to study Landscape Architecture, I knew that I wanted to work with public spaces, whether it be in a design role or in an operations capacity. Working with Film/Special Events and Community Relations was a valuable learning experience in how urban spaces are used for a variety of purposes. Specifically, I learned how the interests of unique groups of users must be balanced with the needs of New York City citizens and tourists. Public parks provide indispensable services to cities that help make urban centers like New York City environmentally, socially, and economically sustainable. Central Park’s various landscapes and planting materials provide habitat for many forms of wildlife within the Park, creating a diverse ecosystem within the urban center of Manhattan. Dene Slope creates a space where pollinators feed on the nectar and pollen of the native wildflowers. Spaces like the Hallett Nature Sanctuary, the Ramble, and the North Woods create areas where birds come during migration or to establish permanent homes. In addition to the wildlife benefits, the Park also reduces storm water, increases air quality, and lowers temperatures. Central Park also helps create social sustainability for the citizens of New York City. The Park is free for all to come to, and it has many activities for all types of people. Dotting the edges of the Park are 21 playgrounds spanning from the north end to the south, on the eastside and the west. This gives families from the Upper East Side, Upper West Side, Harlem, and Midtown walkable options for areas to bring their children. Working with the special events staff, I was able to see the impact that large events have on both the Park and the public. Free concerts like the Harlem Meer Performance Festival attract a diverse group of people. Young and old, men and women, and people of all races and ethnicities come together to listen to free concerts every Sunday outside the Dana Center, each week enjoying a different genre such as salsa, blues, jazz, or country. The economic benefits that Central Park has on New York City are substantial. In 2014, a report by the Central Park Conservancy found that the Park’s impact on creating full-time jobs and tourism contributed $420.8 million in citywide economic output. It also added more than $26 billion to the market value of properties on the blocks adjoining the Park. From my personal experience, I have seen expressive matters venders selling paintings on the Mall, pedicabs and horse carriages bringing people to Bethesda Terrace and Strawberry Fields, and hundreds of tourists asking for the nearest place to get some food. All of these groups help maintain the economy of New York City, whether it be spending inside the Park or throughout the City. Working with the Central Park Conservancy has confirmed what I thought while attending school: I want to work with parks. Whether this means working through a non-profit conservancy or government agency, helping public parks stay well maintained and properly managed has grown from an interest into a passion, and I can only hope to maintain other urban parks to the standard that I have learned here. My mentors have taken time to show me the benefits of working for a park, the difficulties that can arise, and their own passions for the Park, all of which have strengthened my belief that I am following an outstanding career goal. It was my first day at the [79th St.] Yard. I had barely found it after a short detour mistakenly – and dangerously if I might add - walking along the narrow sidewalk of the 79th Street transverse before realizing I might want to turn around and walk directly into the Park. I had just met my mentor, Yanina Kupava, in person, and after introducing me to more people than I had the ability to instantaneously remember, she took me on a brief crash-course tour of the Park to lightly familiarize me with it before starting data collection, the focus of my internship. Not even five minutes into the golf cart ride, “Stop, stop!” A man, presumably a local but donning an Australian accent, flagged us down. We were informed that a raccoon had fallen out of a tree and we went to go check on it. “Stop, stop!” Another patron halted us, this time an older woman wearing a light pink jacket – this was early in summer. We heard the same story and continued toward the raccoon. What I would come to get a grasp of during my internship and continually be impressed by, was just how much the people of New York loved their Park, Central Park. I discovered over the course of the summer how essential to, and a part of the beat of New York City, Central Park is. Urban Parks, like Central Park, are not urban simply because they reside in a city; they are urban because they are built like the city; with just as much of a man-made and purposeful design as the buildings, buses, trains, or other feats of infrastructure that line the public streets. In this way, my perception of urban parks has changed. I no longer view urban parks as an escape from the city infrastructure, but rather the extension of an urban landscape which speaks to and satisfies our collective desire and need to engage with nature, spread out, enjoy recreation, and breathe freely. It is in this quality that urban parks define a city’s livability. The open space coupled with the rugged and industrial terrain of the city provides a natural yin and yang balance that buffers each other and makes the city a welcoming place where people will want to live their lives. Having also imprinted upon me an effect equally indelible to my new understanding of urban parks granted to me by my time at the Conservancy, is also the new, radically different way in which I now think of sustainability. More than environmental suitability, if a park is to uphold its stature as the urban landscape’s natural component, then it is necessary for the park to itself be founded on a firm financial footing to ensure future long-term sustainability. My time at the Conservancy has exposed me to innovative and sometimes even unconventional and varied models of fundraising, such as the Conservancy’s well-known public-private partnership, in addition to specific fundraising efforts from private donors, foundations, and private citizens. Coupled by the Conservancy’s systematic delegation of vendor and concession responsibilities to the appropriate agencies, it can all work in tandem to yield what is a world class park. As I continue to grow in my parks career and gain an increasingly larger role in the creation and maintenance of city parks, the lessons I’ve learned at the Central Park Conservancy this summer – to envision urban parks as the green facet of your city’s urban ecosystem along with the instruction to be open to innovative models that bring outside resource into the parks – will form the foundation of my future approach to urban parks and serve as my strongest takeaways from this internship. I am grateful to the Conservancy for these insights and will be certain not to let them go to waste as I am dedicated to putting what I’ve learned to good use in my stewardship and involvement in public parks moving forward in my career.